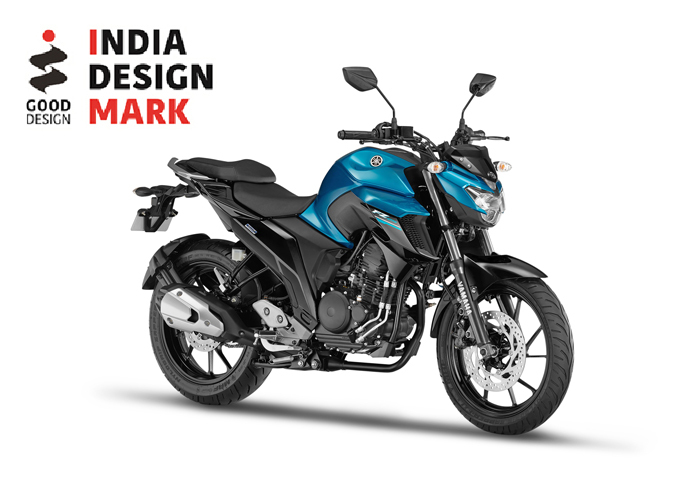 Yamaha Motor Awarded India Design Mark for Seventh Year Running — Second Design Award for FZ25 — - News Releases | Yamaha Motor Co., Ltd.
IWATA, April 19, 2018—Yamaha Motor Co., Ltd. (Tokyo: 7272) announced today that the FZ25 motorcycle- produced and sold by Yamaha Motor's India subsidiary, India Yamaha Motor Private Limited (IYM) - have been awarded the India Design Mark (I MARK) sponsored by The India Design Council. These honors mark the seventh year in a row - every year since the inaugural awards in 2012 - that a Yamaha Motor product has received the I MARK. This is the second award for the FZ25 on top of its achievement at the CII Design Excellence Awards (hosted by the Confederation of Indian Industry). The FZ25 is a street model motorcycle featuring the new 250cc BLUE CORE engine, which delivers both riding enjoyment as well as excellent fuel efficiency and environmental performance. The design emphasizes both the senses of mass forward layout and downforce, evoking the powerful muscles of an athlete. First launched in 2008, the FZ series sits in a relatively high-priced category. However, it has won strong support from young customers, and these popular models have sold a total of more than 1.5 million units since their launch. The FZ25 is one of the models with which Yamaha Motor aims to further increase sales in the expanding high-priced range of the Indian motorcycle market. The India Design Council is affiliated with the Indian Ministry of Commerce and Industry and has established the India Design Mark design award (corresponding to the G Mark, Japan's Good Design Award) through a partnership agreement with the Japan Institute of Design Promotion. The inaugural round of applications and assessments was held in 2012.